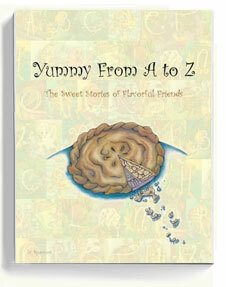 Come join the Alphabet Sweeties and all their friends on a yummy journey from A to Z. Twist your tongue with tantalizing alliterative verse while savouring each and every letter. Whether it's along the Amber Amazon or over the Majestic Mushroom Mountain, you will find yourself surrounded by delightful drawings and whimsical words. The alphabet is as sweet as pie! "If you like combining art and reading, then a new children’s book by Canadian artist Sparrow called Yummy from A to Z is sure to get your attention. For each letter of the alphabet, Sparrow has created a tasty character, with names such as Vivacious Vivian Vanilla Wafer and Kiki Key Lime Pie. Each of these tasty characters is drawn in a setting that emphasizes other items that begin with that letter as well. For instance, Yummy Yolanda Yogurt has adventures with a Yammering Yak and some yellow yarn among other things." The illustrations have a beautiful, soft quality that comes from a technique Sparrow says she stumbled upon while creating a painting one day."